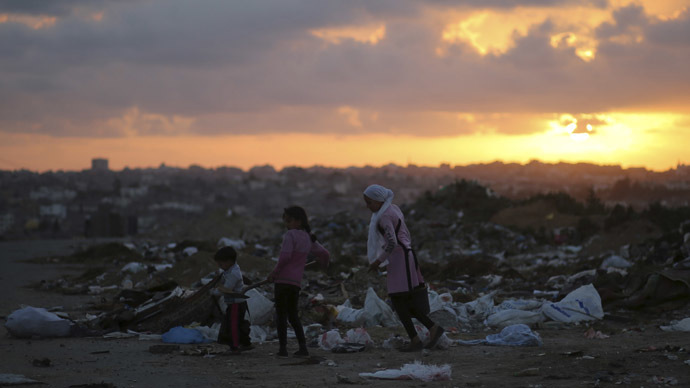 Less than 27 percent of the $3.5 billion aid pledged by international donors to help rebuild Gaza in the wake of unprecedented destruction caused by last summer's Israeli Operation Protective Edge has been disbursed, a new report says. The Association of International Development Agencies stated in its report, "Charting a New Course: Overcoming the stalemate in Gaza," that while comprehensive data on individual pledges and disbursement has not yet been made publicly available, the World Bank found that only 26.8 percent ($945m) of the funding earmarked for Gaza had been disbursed so far. "The promising speeches at the donor conference have turned into empty words," Oxfam executive director Winnie Byanyima said. "There has been little rebuilding, no permanent ceasefire agreement and no plan to end the blockade. The international community is walking with eyes wide open into the next avoidable conflict, by upholding the status quo they themselves said must change." According to the report, international donors have been hesitant to pay out their reconstruction pledges without progress towards the reestablishment of the Palestinian Authority (PA) in Gaza. "The paradox is that the lack of reconstruction is exacerbating the potential for conflict," the report says. "By refraining from releasing funds due to fear of political instability in Gaza, donors are entrenching divides that heighten instability." Meanwhile, the cost of relief, recovery and reconstruction in Gaza in the aftermath of the Operation Protective Edge (OPE) has been estimated at $4 billion. According to UN Secretary-General Ban Ki-moon, the war caused an "unprecedented level of destruction" and it could take decades to complete the recovery from the man-made humanitarian crisis. While there have been repairs to some damaged buildings, almost no large-scale reconstruction projects have started to date, and no permanent housing has been rebuilt, the report has stated. Only 36 schools with minor damage have been repaired out of a total of over 258 damaged and eight destroyed in the attacks. Reconstruction has barely started on hospitals and health clinics due to a lack of construction materials and funds for reconstruction. Efforts to revive the economy in Gaza are hampered by growing deficiencies in the energy and water sectors, which were already in a critical condition prior to the military operation in 2014. Gaza's sole power plant was hit by Israeli airstrikes twice during the Israeli offensive. Despite having been repaired, it was recently forced to shut down as a result of a lack of funds to replenish fuel reserves, and currently runs on half capacity. According to Tony Laurance, CEO of MAP UK, the world is "shutting its eyes and ears to the people of Gaza when they need it most." "Reconstruction cannot happen without funds, but money alone will not be enough. With the blockade in place we are just reconstructing a life of misery, poverty and despair,” he says. Operation Protective Edge, the 50-day military campaign launched against Hamas last year, left 12,400 housing units completely destroyed and over 17,000 families (100,000 individuals) homeless. At least 2,132 Palestinians were killed, of whom nearly 70 percent were civilians, including 501 children, according to OCHA (Office for the Coordination of Humanitarian Affairs) data. Amnesty International found that "the repeated, disproportionate attacks on homes indicate that Israel's current military tactics are ... fundamentally at odds with the principles of international humanitarian law." It also noted that "Palestinian armed groups, including the armed wing of Hamas, repeatedly launched unlawful attacks during the conflict, killing and injuring civilians." Operation Protective Edge was the third and most destructive Israeli military operation in Gaza in the last six years. The temporary ceasefire reached late in August 2014 has not prevented further violence, however. As of the end of March, there were over 400 incidents of border and naval fire by Israeli forces since the ceasefire, and four rockets have been fired from Gaza toward Israel, resulting in no injuries, according to data provided by the Gaza Strip NGOs Safety Office (GANSO).